Stephen who owns vape-licious e liquids in Scotland, and who is also a very dear friend of mine, asked me to let you, the vaping public know, that for the time being, his online store will be open on Thursdays and Fridays each week, at this present time. All orders made on these days will be shipped to his customers on Mondays. Stephen, known by all of his friends on facebook as 'Stevo' has a very busy work schedule, and with his multiple shifts, finds it difficult to keep the online store open on a daily basis. He is, at present, a one man band, creating his amazing flavours by himself. However, future plans to open the shop full time, is in the not too distant future. Vape-Licious E-Liquids has been set up primarily for the purpose of selling gourmet/bespoke e-liquids to the vaping public. It started off as a hobby, and much to Stevo's surprise, his e-liquids were sought after by many. It was then, he decided, to begin a new venture as a premium juice mixer. Stevo has been renowned for his premium e-liquids, especially his 'Virtual Custard' and he deserves the praise his flavours bring. Vape-Licious is well known amongst the vaping community. His skills, dedication and determination to give the vaping community only the best, gives Stevo the drive he needs to succeed. He is well known and highly respected by many, and word is getting around fast, just how good his e-liquids really are. The ingredients are all sourced within the UK, and manufactured to the highest standard. Vape-Licious E-liquids, endeavours to provide customers with the quality and excellence they expect, and will ensure they provide a consistent standard of service to each and every customer. There are four tailor made e-liquids available, and the good news is, more flavours will become available soon. He has been working on a new juice for the past couple of months, and it will be added to the Vape-Licious website, for all of you to try. Vape-Licious e-liquids all come as standard 60PG/40VG. Each bottle of Vape-Licious e-liquids are bottled in 10ml and 30ml formats. They come in four nicotine strengths of 6mg, 12mg, 18mg and 24mg. If you require zero nicotine, please let him know and he will make it to suit your needs. 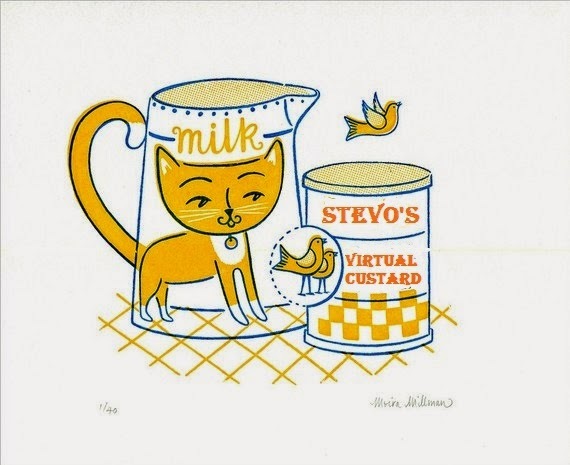 Virtual Custard - Vanilla Custard with a few secret flavourings. Sweet, moreish, thick, and creamy, and is now my personal favourite. Try Some. Beaver Juice - An addictive blend of pear, cream and coconut. Never has a beaver tasted so good. 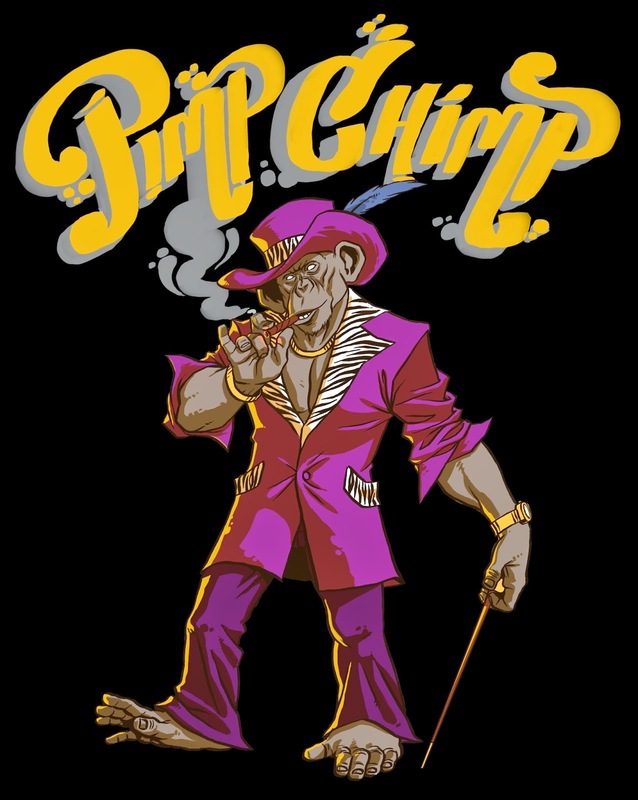 Pimp Chimp - A revised Banana Custard flavour. More intense, more delicious, more bonkers than before. You gotta' try this one. May contain traces of jungle. 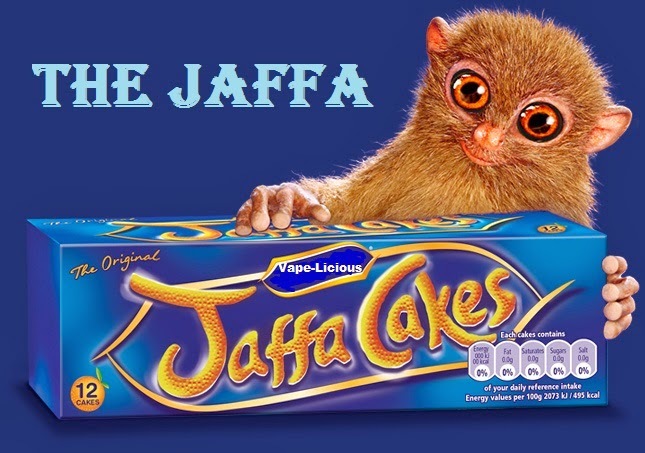 The Jaffa - Is it a cake or is it a biscuit ? You decide in this yummy e liquid. My opinion of these juices will be my true and honest opinion as always. All bottles are beautifully labeled and easily read, and come with tactile warnings and child proof safety caps. I am using my Veritas dripper at 0.7ohms, on my viggo mechanical mod, set up using 26 awg kanthal wire and cotton, with a fresh battery at 4.2 volts. I have chosen my preferred nicotine strength of 12mg, and the mix is 60PG/40VG. I will be using this set up throughout my reviews. On opening the bottle, a beautifully sweet, creamy, vanilla, wafted it's aromas from the bottle. A warm, satisfying feeling came over me. It's scents were rich, decadent and thoroughly pleasing. While trying to identify the elusive scent that left me intoxicated, and my mouth watering, the excitement grew as I knew by the aromas, this juice was going to be something special. I drew the vapour into my mouth, immediately appeased by the wonderful flavours that made my tastebuds stand on end. My whole being, warmed to the subtlety of the flavours. It was deliciously creamy and very intensifying. The creaminess coated every part of my mouth with a velvety smoothness, soft and soothing as it glided over my tongue, tickling the back of my palate. As the thick creaminess rested on my tongue, it filled my mouth with a sense of fulfillment. Delicate, yet powerful, and one I knew I needed to have at all times in my daily rotation. Stillness abound me, as the soft essences permeated around the room. A room filled with stillness and contentment. Slowly putting me into a state of pure bliss. On the exhale a wave of flavour rolled slowly over my palate, and onto my awaiting lips. I sensed a certain spiciness, not unlike nutmeg but very lightly hidden, lurking in the background of this mysterious juice. I licked my lips with every exhale, knowing each time I would taste a gorgeous powdery sweetness, similar to icing sugar but not in anyway cloying or overly sweet. Just perfect in every way. Vape-Licious has managed to produce the perfect vape with 'Virtual Custard'. It's smoothness, and creaminess, leaves you wanting more. It has beautiful natural notes of vanilla, and all things warm and comforting. A juice which lingers on the palate for a while afterwards, and sends you into a state of nirvana, a place of perfect peace and happiness. The flavours were perfectly balanced. There was no chemical smell, or bitter aftertaste. The vapour production for a 60PG/40VG juice was exceptional, and the throat hit for 12mg was simply perfect. A very smooth and satisfying e-liquid. I give this juice a massive 10/10 for flavour, throat hit and vapour production. If you're looking for a high quality dessert style vape, It's one not to miss. I will be stocking up on this one once I finish my recently ordered 90ml. I would like to add that I have tried lots of custards in my two and a half years of vaping, including GVC (Grants), and this surpasses them all. They are all very nice custards, but they lack the complexity and creaminess that Vape-Licious Virtual Custard' has. An all day vape for me without being sickly or overpowering and still having all the creaminess and rich flavour without being cloying. This is one you could vape all day. This is now my all day vape. On opening the bottle, a semi sweet chocolate aroma escaped from the bottle. Deep, dark and rich, similar to 'Willies Cacoa' or 'Green & Black's' range. I could pick out notes of 'Valencia orange', sun kissed, fresh, and juicy. A match made in heaven, and the scents from the bottle were sublime. Holding the bottle beneath my nose, I breathed in deeply as I inhaled the aromas. My sense of smell helped me to better the taste of all the wonderful flavours in my juice. I have always enjoyed 'Jaffa Cakes', since I was little. They are particularly nice with a good espresso coffee, leaving both flavours to pair off nicely together. 'Jaffa Cakes' were always a favourite of mine after a meal, curled up in front of the television with a coffee in one hand and a whole box of 'Jaffa Cakes' in the other. On my first initial inhale, a beautiful, full bodied, crisp, dark chocolate, flowed over my moist lips, rolling onto my tastebuds, settling on my palate, and melting on my tongue. Slowly and sensually, coating every inch of my mouth, with a deep creamy chocolatey sweetness. The chocolate was light, and smooth, but still prominent in taste. On exhaling, the tangy, zestiness of the orange came through. Notes of a soft, squidgy, sponge biscuit, lay below the rich, dark chocolate, and the consistency of the juice was just right. A perfect balance and a beautiful vape. This is a complex juice. It is sweet but not overly sweet. It's richness didn't in any way make it cloying. It is an extremely pleasing vape, and one I will definitely order again after I finish my 30ml bottle. There was a solid amount of vapour, that is rich and creamy. As with all of Vape-Licious e-liquids, throat hit, vapour production, and flavour are all perfect. one I recommend, if you haven't already tried some. 'Beaver Juice' is a beautiful blend of Fresh Sweet Pear, Coconut and cream. On opening the bottle and inhaling slowly and deeply..... I could smell the aroma of sweet, natural pear. Wet, juicy and ripe. The scent reminded me of a comice pear. Very sweet, with a great fruity aroma. Well rounded and smooth. Their bright flavour and deep sweetness are the perfect match for fennel or avocado, and are just as nice blended with coconut and cream. On the inhale, wet, oozing juicy pear flesh, balanced nicely on my palate. It was sweet, slightly tart and very fruity. The flavours were enhanced by the beautiful creamy sweet coconut. Resting nicely on my tongue, and tasting extremely moreish. Coconut, pears and cream have always been the perfect match in home cooked desserts and tarts, and the flavours Vape-Licious has used, all blend perfectly together. I've never been one for vaping pears but this is very palatable and worth trying, if you haven't already done so. On the exhale, a deliciously creamy coconut, brushed over my lips, leaving behind a very natural aftertaste of sweet ripe pears. The pear was enhanced by the rich, sweet flavour of the coconut and cream, and lingered on my palate for a little while after. 'Beaver Juice' was very nice, and If you enjoy fresh pear vapes with coconut and cream, then this one is for you. A brilliant blend of flavours, and very well thought out. All three juices were lovely. My favourite being 'Virtual Custard', followed by 'The Jaffa' which is a very moreish vape, and last but not least, 'Beaver Juice'. Brilliantly mastered, very complex and carefully thought out. 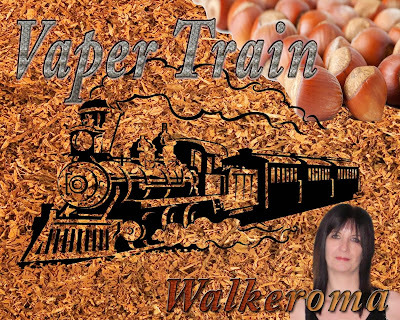 Vapour production for a 60PG/40VG was exceptionally good, Throat hit was perfect for 12mg, which is my chosen and preferred nicotine strength and flavour was outstanding. Vape-Licious has certainly done the vaping community proud. Good Work Stevo! 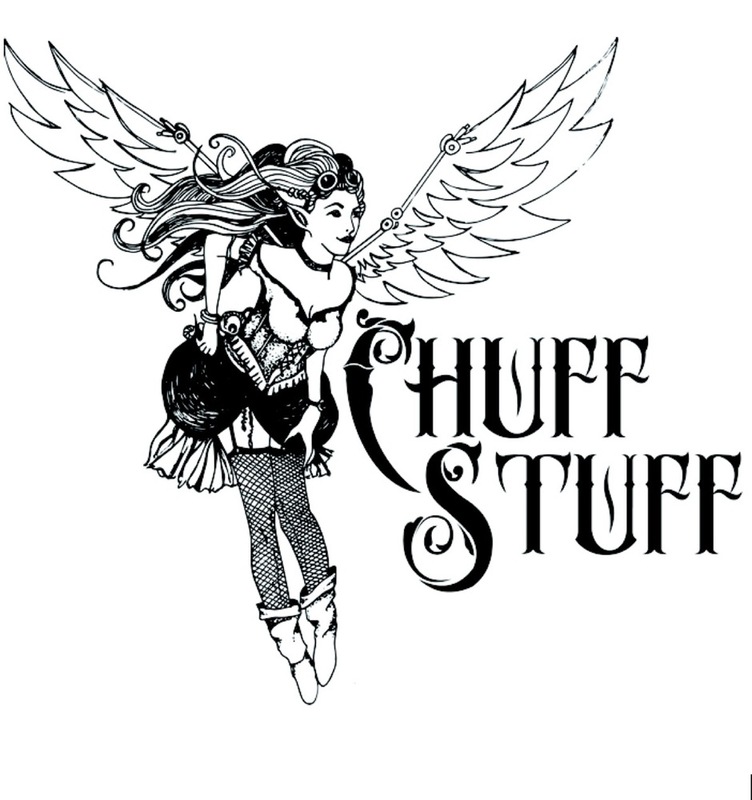 If you would like to try any of Stevo's e-liquids, You can Contact him, either on our facebook group http://www.facebook.com/thetootsuite/ where he will be happy to answer any questions you may have, or order directly from his online store at http://www.vape-liciouseliquids.co.uk/. I would like to stress again, Vape-Licious e-liquids are open to the public on Thursdays and Fridays each week, and orders will be shipped out each Monday, until further notice, due to heavy work commitments. Thank you all for taking the time to visit my blog and read my reviews.